Lisa Shim is the Senior Vice President of Corporate Development at BankUnited, overseeing corporate strategy, marketing and digital banking. 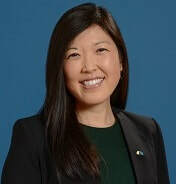 Ms. Shim has been a part of the BankUnited family since the new bank was formed in 2009 and has been involved in a wide range of critical initiatives throughout her tenure here at the bank, including the bank’s merger and acquisition strategy, internal corporate strategy, and digital transformation journey. Prior to BankUnited, Ms. Shim worked in the financial institutions group at Merrill Lynch and the retail bank division for Countrywide Bank. Ms. Shim graduated with a B.A from Stanford University and an M.B.A. from Kellogg School of Management.